Lama Zopa Rinpoche lights a large butter lamp in Kopan Monastery Gompa, after arriving from the airport at 11:45 p.m. Rinpoche did three long prostrations and then offered khatas to the main statues, including the Lama Yeshe statue, Nepal, March 2013. Education Services News: Italian Basic Program Online Success! Foundation Store Offer: 40% Off Discovering Buddhism DVDs! Lama Zopa Rinpoche gave the following advice to Ven. Thubten Dondrub, who is resident teacher at Buddha House, Australia and videoed the talk, while waiting for a flight to Hong Kong at Kuala Lumpur Airport in Malaysia. An excerpt follows – please read the full advice here. “Good morning, good afternoon, maybe good night! Thank you very much; thank you so much for your prayers for me, for sentient beings, for Buddha, from where all sentient beings receive their happiness. For sentient beings to have not only temporary happiness – when we say ‘happiness,’ should not think only temporary happiness, only samsara happiness – don’t think [that] – we must think ultimate happiness, liberation from samsara forever, then peerless happiness – full enlightenment. So when I recite the long version of the Six Session [Guru Yoga], instead of happiness I say ‘enlightenment,’ full enlightenment, the cause of enlightenment. I change that [word because] it helps my mind to think of highest happiness, true happiness. Just to say ‘happiness’ normally means temporary happiness, makes one think of temporary happiness. And we have had temporary happiness numberless times from beginningless rebirths. 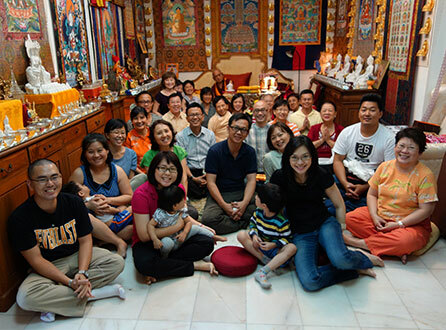 Lama Zopa Rinpoche meets the directors, spiritual program coordinators and board members of the FPMT centers and service in Malaysia, March 2013. The Italian-language Basic Program Online offered by Istituto Lama Tzong Khapa (ILTK) in Italy had its first-ever final exam this March. All 10 participating students passed – a huge achievement for all involved! Kind thanks to Basic Program Online tutor Vania Tesser, who provided students with the care, support and inspiration needed to get this far, and many other staff at ILTK who contributed over the course of five years. This is an FPMT milestone: previously we had no homestudy students completing a Basic Program and final exam in any language other than English. Congratulations to all! Have you ever wondered how to offer food to the 2,600 monks studying at Sera Je Monastery? Learn more and see what an offering of this magnitude looks like. 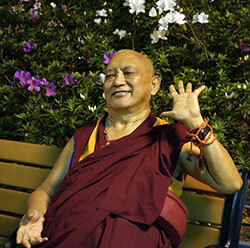 Lama Zopa Rinpoche relaxes and enjoys the gardens after walking back from dinner after teaching in Hong Kong, March 2013. Keep current with the worldwide FPMT mandala by reading Mandala online! 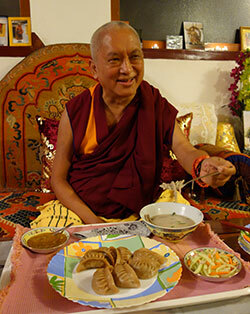 Our daily blog shares news and updates from Lama Zopa Rinpoche and the more than 160 FPMT centers, projects and services around the world as well as timeless stories from the Mandala archive. Recent features include new posts from Ven. Roger to his popular blog “Life on the Road with Lama Zopa Rinpoche;” a story from the Mandala archive about Kirti Tsenshab Rinpoche’s extraordinary journey to Antarctica in 2006 to bless the world’s waterways; plus exclusive interviews and stories from the latest issue of Mandala and much more. Lama Zopa Rinpoche having dinner at his brother Sangay Sherpa’s house (Sangay is director of Lawudo Retreat Centre) and eating thor, made from a deep-rooted wildflower in the Himalayas, for the first time since he was a child, Nepal, April 2013. Some years ago due to popular request we made available a short informative document on how to relate to the spiritual teacher, written by Ven. René Feusi. Our wish was that this would help students at all FPMT centers, and most particularly new students, by answering so many of the frequently asked and essential questions on how to properly relate to a spiritual teacher, ensuring that students coming to your center would be well informed and protected from mistakes. We asked you to please display this very informative booklet publically for all to see. Now we would like to know if you have been finding this booklet helpful. Please let Tom and Claire know, together with any other related feedback. Thank you! Get 40% off our most popular and wonderful Discovering Buddhism series on DVD. Available with subtitles in English, French, Spanish, and German. For those centers who order more than 30 copies, no matter where and how far you are, the Foundation Store will offer free shipping on top of the 40% discount! These special bulk orders should be addressed to Diana Ospina. 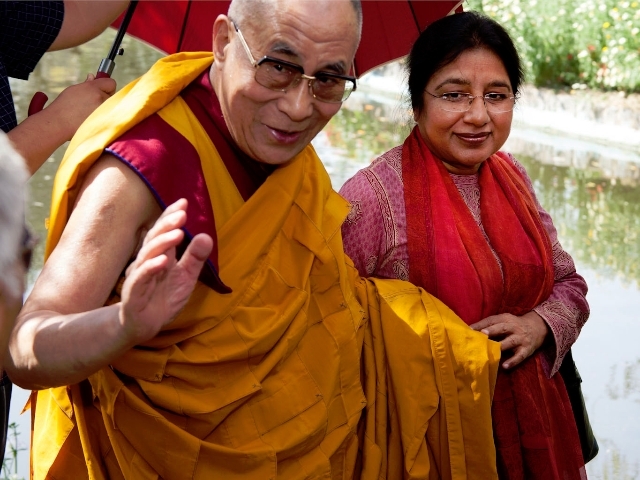 His Holiness the Dalai Lama and Dr. Renuka Singh (director of Tushita Mahayana Meditation Centre) at Tushita’s 20th Delhi Dharma Celebration, India, March 2013. Photo courtesy of Ven. Kabir Saxena. “Approximately 4,000 people attended the event on March 9, which was held in front of a beautiful Buddha statue that was sponsored by His Holiness and offered as a gift to the Indian people two decades ago in gratitude for the gift of Dharma. This year there were about 70 volunteers from Ladakh, and there were also volunteers from Jawahar Lal Nehru University where Tushita director Dr. Renuka Singh teaches. So this means that young people are being exposed to His Holiness and the ‘Three Principal Aspects of the Path to Enlightenment,’ which was the topic for the afternoon. We have resident teacher opportunities at Ganden Yiga Chözin, Pokhara, Nepal and Tong-nyi Nying-Je Ling, Copenhagen, Denmark. Land of Calm Abiding, USA is looking for a director. Nalanda Monastery, France is looking for a qualified Tibetan-English interpreter for Basic Program; while Root Institute, India needs a school manager, a physiotherapist, and nurses.